pureLiFi continues to lead LiFi technology adoption and reveals the LiFi-XC system that is three times smaller than the previous generation. The LiFi-XC is three times smaller than the previous generation and provides high-speed, bi-directional, fully networked and secure wireless communications through light. The significant progression pureLiFi has made in the miniaturisation of real LiFi technology means that it is now small enough to be integrated into many laptops, tablets and smart appliances. The LiFi-XC is the world’s first certified, complete LiFi system. The LiFi-XC system consists of an access point and USB dongle that is compatible with Windows 7, Windows 10, Linux and MAC OS operating systems. This step forward in making LiFi commercially available will allow pureLiFi to scale deployments and begin to meet the excitement and demand for this new technology. LiFi is increasingly viewed as a disruptive technology that can change the way the mobile internet is used as part of future 5G cellular networks while being an enabler of the emerging Internet of Things. The LiFi-XC offers partners and customers the ability to deploy a fully networked LiFi solution. Unlike other VLC products, the LiFi-XC supports multiple access, roaming, complete mobility and ease of use – providing a level of user experience that is comparable technologies such as Wi-Fi with all the security and density benefits of the light spectrum. For future systems, LiFi is well-positioned to help solve the rising concern that our growing reliance on connectivity is creating an unprecedented strain on wireless networks resulting in “The Spectrum Crunch”. LiFi is one of the wireless technologies that will enable the development of IoT, 5G and will open up thousands of additional channels for wireless communications and unleash unprecedented data and bandwidth. 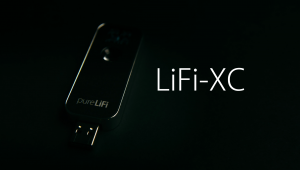 “It is extremely gratifying to see the vision we had over 10 years ago come to life with the launch of LiFi-XC which is not only testimony to the engineering brilliance of our highly skilled team at pureLiFi but also a significant step towards a fully connected world. The LiFi-XC is the defining moment in the progression of LiFi technology providing an opportunity for world wide adoption. Welcome to real LiFi in real life.